We look forward to getting you up and running! We want to make it easy to register and begin filling out Survey 2017 online. Please note that we will be sending out email invitations for the online Survey 2017 over several months. The email will include a specific and unique link intended for you alone. You’ll need that information to register for and complete Survey 2017. On this page, you’ll find detailed instructions to help you through the process. The button below links to a generic template without your unique link; it’s for demonstration purposes only. You’ll learn the steps involved in signing up for Survey 2017. 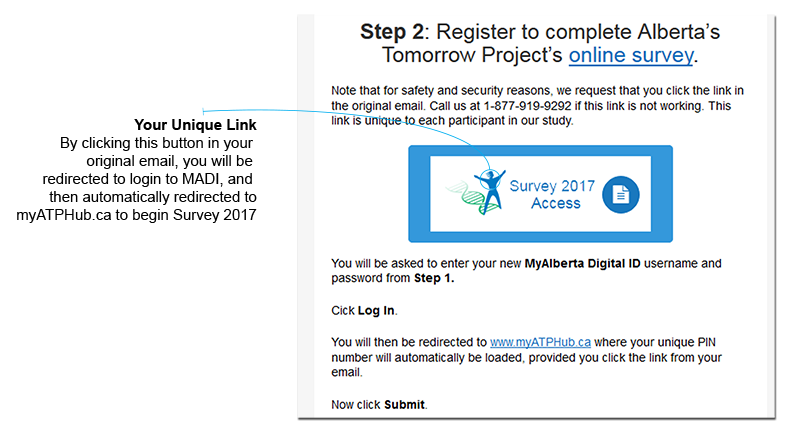 To begin, open the email from Alberta’s Tomorrow Project inviting you to fill out Survey 2017 online. Haven’t received the email yet? We’re sending invitations out over several months. You can wait until we send it to you, or contact us for your unique link to get started on Survey 2017 right away. Please note – We have partnered with the Government of Alberta to use this secure system for registration only. None of your survey information will be accessible by or shared with the government. 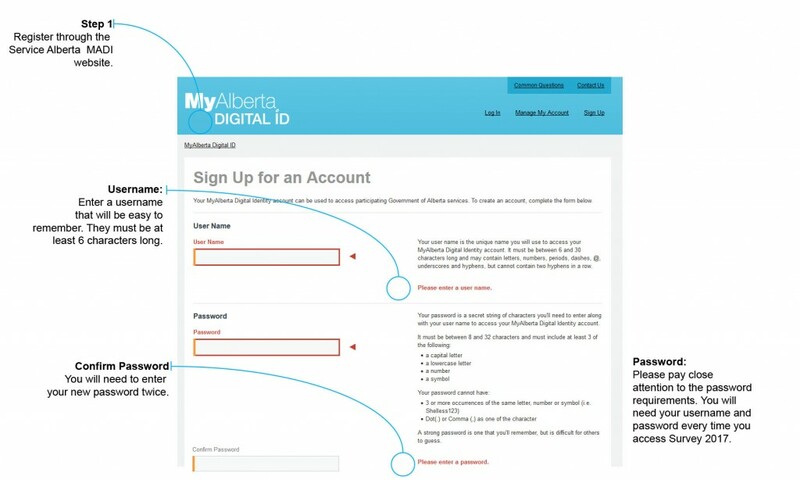 The registration process on MyAlberta Digital ID (MADI) takes a few moments, so keep your new username and password handy. You’ll need your MADI account information for Step 2, and each time you log in to work on Survey 2017. You will receive a first confirmation email from no_replyid@gov.ab.ca. Click the link in this email to confirm your account. 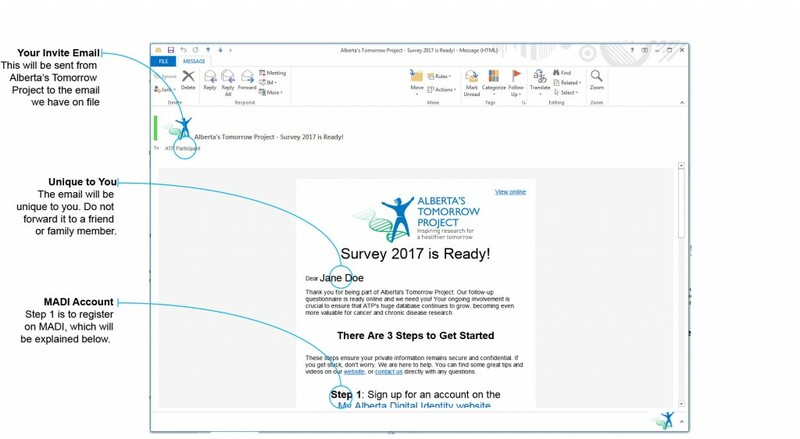 You’ll then receive a second email welcoming you to the MyAlberta Digital Identity platform. You may ignore this second email for Survey 2017 purposes. The link emailed to you contains a personal identification number (PIN) that is specific and unique to you. It is required for access to Survey 2017. You will be asked to log in with your username and password from Step 1, above. On myATPHub.ca, your unique PIN will automatically be entered in the required field. Click Submit. If your PIN is not automatically entered, please make sure you clicked the link in your original email from Alberta’s Tomorrow Project. If you are still experiencing difficulties, please contact us. If you need a break, come back later to myATPHub.ca (Step 2) and continue where you left off. Double check your Junk folder if, after contacting us, you still have not received the email. Connect with us if you’re having any issues. We’re here to help. You should be able to complete Survey 2017 in 45 minutes! 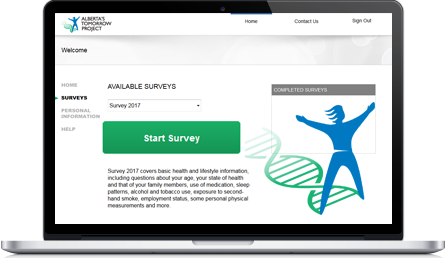 Your survey information is crucial for Alberta’s Tomorrow Project and its research value over the decades ahead. If you need any help with registering for Survey 2017, or filling out the questionnaire, please contact us. Together, we are inspiring research for a healthier tomorrow. Still stuck? Contact us or visit our FAQ!